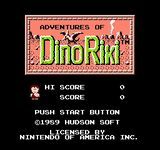 ``Adventures of Dino Riki is an overhead shooter created by Hudson Soft, similar to games like 1943: The Battle of Midway, where the object is to dodge on-screen enemies. Dino Riki can jump or shoot weapons (rocks, axes, boomerangs, and torches) to kill the various enemies around him. Dino Riki can pick up power-ups including speed boosts and wings that enable him to fly over hazards on the ground, as well as weapon upgrades. He starts his adventure throwing rocks that have a very limited range and power, and can upgrade to axes and then boomerangs each increasing the range and spread of his shot, finally gaining a rapid-fire volley of torches that spreads across the screen. He utilizes these caveman weapons and power-ups to help kill enemies and avoid the dangers of a Neanderthal life. He progresses through three types of worlds (land, ruined city, and mountains) and plays through four worlds total. Worlds one, two, and three are one stage each and have checkpoints, but world four is four stages with no checkpoints. At the end of each stage, Dino Riki must face a boss. The main character, Dino Riki, was modeled after the famous Japanese professional wrestler Riki Chōshū. Source: Wikipedia, "The Adventures of Dino Riki", available under the CC-BY-SA License.